Christie L. Gilson, Ph.D. '08 SpEd, assistant professor of Education at Moravian College in Bethlehem, Pa., has been nominated by President Barack Obama to a key administration post. She will serve as a member of the J. William Fulbright Foreign Scholarship Board (FSB), which was announced by the White House on March 2. She will serve a three-year term with the possibility of serving a second term. Gilson anticipates that her appointment will officially begin during the J. William Fulbright Foreign Scholarship Board meeting June 11-12, which will take place in New York City. "The extraordinary dedication these men and women bring to their new roles will greatly serve the American people," the President said about Gilson and the other nominees. "I am grateful they have agreed to serve in this Administration, and I look forward to working with them in the months and years to come." Gilson has authored or co-authored numerous peer-reviewed journal articles and book chapters in special education and disability studies. 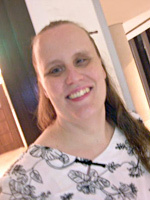 She was awarded a Fulbright Fellowship to study higher education for students with disabilities in Hong Kong in 2006. Gilson, who is blind, teaches English to blind adults in China using Voice over IP (VOIP), and has mentored youth with disabilities in Germany, China, Hong Kong, Singapore, Spain, Taiwan, and the United States. She received a BSW from Illinois State University and an MSW and Ph.D. in Education from the University of Illinois at Urbana-Champaign. Gilson said her appointment was not a surprise, as no White House appointment ever is. She began working on filling out forms for the vetting process last May. "When I got the initial call to see if I would be interested in serving on the FSB, I had butterflies in my stomach. Now that the appointment has really happened, I’m still pinching myself every day," Gilson said. She added that the nomination process and her reaction to it brought back some good memories. "It’s the same way I felt while I was on my Fulbright in Hong Kong in 2006 as I researched the experiences of students with disabilities in higher education for my dissertation." She said that she anticipates bringing the following contributions and perspectives to the board: "My comparatively recent Fulbright experience; my continued contact with colleagues and friends from Hong Kong, Mainland China, and Taiwan; and my lived experience with disabilities." As far as what she will gain from the experience, she said the extent of what she might take away from serving in the Obama administration "is unfathomable at this point. However, I’m looking forward to learning how boards function on a national level," Gilson projected. "I’m excited about increasing my knowledge—and updating my understanding—of global issues. Promoting the Fulbright program to foreign nationals and to fellow U.S. citizens will bring me a real sense of satisfaction," she added. While some might be apprehensive about taking on such an important role, Gilson said she "most assuredly" looks forward to her White House post. She explained that learning about the cultures and languages of the world is something she’s always loved to do. "I enjoy sitting on boards that better the lives of people with disabilities, and I hope to help the Fulbright program be even more welcoming of applicants with disabilities," Gilson said. "As an advocate for social justice, I’m thrilled to be supporting President Obama in this tangible way." Gilson said her parents prepared her long ago to serve during such a time as this. "From the time I was a little girl, my parents told me that, as a person who is blind, I would have to be smarter, better-prepared, and more flexible than the average job seeker without a disability," Gilson recalled. "Though I wish I could believe that people with disabilities no longer need to over-compensate for their disabilities, I know that we still do. I think this applies to people of other minority backgrounds too. So, throughout my career so far, I have been driven to keep my fingers in lots of pies. "I still believe in the adage that, when seeking employment, it’s not what you know; it’s who you know," Gilson continued. "While I was pursuing my master’s degree at Illinois, I served on statewide boards of directors. While I was a doctoral student, I was appointed by Illinois' governor to a statewide board and was elected as chair of that board. I did not seek out the national board appointment by President Obama. I would not have dreamed I would be worthy of such a position. But, when the opportunity came knocking, I eagerly welcomed it," Gilson explained. "I feel that hard work, curiosity about things with which we are not familiar and the willingness to embrace new opportunities are important ways to get involved on all political levels." Gilson urges curious types to cultivate that trait in their academic careers. "Like it or not, the twenty-first century means that we must interact globally, rather than just within the United States. Those who have multicultural competencies will fare better than those who do not in this job market." Not surprisingly, Gilson said she challenges herself to venture out of her comfort zone quite often. "Yes. At the time, it is daunting," Gilson admitted. "But, when I take on a seemingly impossible task and succeed, I’m the stronger for it. So, I’m of the mindset to rarely turn an opportunity down. "If people want to get involved nationally and internationally, they need to get out of their comfort zones, develop many areas of inquiry about which they are passionate, be willing to work hard, listen much more than talk, and stay humble," she said. She said her adviser, Professor Stacy Dymond, pushed her to write in a more balanced manner. "She never lowered her expectations for me because of my blindness,” Gilson said. "I model my own work ethic after hers." She added that she will be forever grateful for the opportunity to take classes from "renowned academicians" such as Jennifer Greene, Daniel Walsh, Jan Gaffney, Stacy Dymond, and Tom Schwandt. "Sitting in meetings with very driven professors helped me to learn appropriate interactional styles for academic meetings," Gilson said. "The amount of writing I did at Illinois has helped me to reach a new level of ease with producing high-quality work." Gilson’s time at Illinois helped her to learn about herself, as well. "I learned that I stressed out about qualifying examinations way too much. I discovered the importance of getting enough sleep each night. During the months of seemingly-endless writing that I did, I forced myself to socialize at least once per day. I made time to cultivate friendships and keep up with my physical exercise," Gilson said. No doubt she will take all those valuable lessons from her time here at Illinois—as well as those from her parents, those from her time abroad, those spent far and away from her comfort zone, and those from her career as a professor—and serve the White House and our country well. Middle Photo: Mr. Rye Barcott and Dr. Christie Gilson have been appointed by President Barack Obama to the J. William Fulbright Foreign Scholarship Board. The two new members were sworn in at the U.S. Department of State in Washington, DC by Principal Deputy Assistant Secretary of State for Educational and Cultural Affairs Adam Ereli.